I was at the grocery yesterday when I spotted this booth selling potato chips. It was so tempting I had to stop and buy a bag. 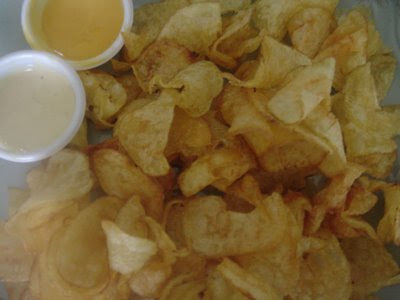 The white dip is made of parmesan cheese and garlic, the yellow one is honey mustard. Ang sarap nito mommy liza pulutan while watching tv or movies. Anyways, I nominated you as top 10 emerging influential blog for 2009.
potato chips i love! it is still 4am here and now i am hungry! talk about me being a couch potato! This is my favorite! sarap sarap talaga. Thank you for voting for me in the First Official Dork-Off at Lin's Duck and Wheel With String. The votes are in and the winner has been announced. Thanks so much for your vote. Be sure to come back and check out Lin's blog and my blogs. i played MYM too, here! I love potato chips! Those dips sound delicious! You know what they say, "you can't just have one". Happy MYM! I'm a die hard for these potato chips too! I think I'd like to try the parm cheese and garlic...sound yummy. Now wait -- your blog into says it will talk about nutrition! ha ha...somethings in life can't be made nutritious (potato chips) but they can be made very yummy! Good job! I picked Cheddar, Carmelized Onion and Sweet Chili. I ripped open the three seasoning packets, poured some of each into a bag of chips, folded over the top, and then shook, shook, shook and shook. The results were surprisingly tasty, though there wasn't much of a chili kick.He!He!He!. Just to let you now, I left an award for you on my blog today.